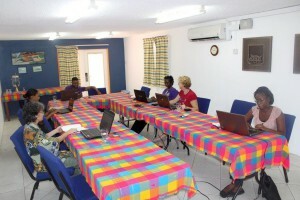 The Grenada Hotel & Tourism Association (GHTA) conducted a workshop in the area of Email Marketing to several of its members on Tuesday 9 April 2013 at the True Blue Bay Villas & Resort Conference room. At the workshop captioned, “Leveraging the Power of the Inbox — Email Marketing 101”, members were instructed on how best to reach customers through effective email marketing. The training provided all information needed to launch an email marketing campaign from conceptualization through measurement and reporting. “Members have been looking forward for some time to learning more about how to meet and provide the needs of their digital audience. They were pleased with the training they received and feel that they are now in a position to grow their businesses through the use of Email Marketing”, said Clevon Noel, Information Technology Officer of the Grenada Hotel & Tourism Association. “The GHTA, recognizing the importance of Information Technology in today’s world, employed Clevon Noel two years ago. He has worked diligently toward raising the Association’s profile and is happy to impart his knowledge to members which will equip them with the tools needed to grow their business”, said Ian Da Breo, President of the Grenada Hotel & Tourism Association. The Grenada Hotel and Tourism Association (GHTA) is a non-profit, non-governmental organisation tasked with being the representative private sector voice of the island’s tourism sector. The Association is managed by a Board of Directors responsible for guiding the Association’s strategies and polices, while the secretariat is managed by an Executive Director responsible for the day to day duties of the Association. GHTA’s main purpose is to advocate and lobby on behalf of its members on matters affecting the tourism industry. In addition, the Association promotes educational opportunities for industry workers; assist in the development of cultural activities and aids in marketing the businesses of its members.